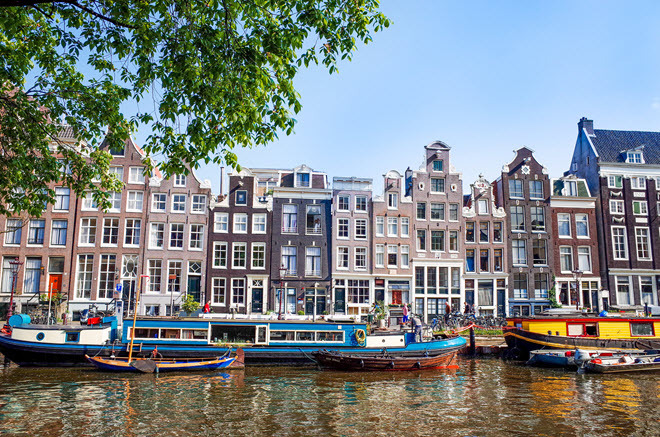 Amsterdam is one of the most visited Northern European cities, for its diverse and accepting culture, and forward-thinking cultural positions. Your culinary arts education is well served by The Netherlands strong hospitality and culinary industries. Amsterdam’s food culture reflects one of the most cosmopolitan and modern cities in Europe. Major epicenters are Amsterdam, Rotterdam, The Hague, and Utrecht. Here you’ll discover cultural trends, unique culinary environments, and strong international business presence. In fact, Rotterdam is one of the largest European shipping ports. Travel and tourism are integral economic components that drive a perennial appetite for creative culinary minds. An international culinary arts education, laced with experiential forays into Dutch gastronomy provides the ideal blueprint for achieving employment success in the fertile food service and hospitality industry. Well-qualified chefs work in all areas of hospitality, in roles like Executive Chef, Sous Chef, culinary manager, or owner/operator. Your upward mobility within the industry is enhanced by your training at one of the country’s top academies. Two prestigious English-speaking culinary arts schools maintain busy Dutch campuses, one in Amsterdam and the other in The Hague. In many ways, The Hague resembles Washington, DC, so international travel is at the center of the city’s food economy. Distinguished hotels and restaurants operate within the city, providing cooking and management jobs for hospitality school graduates. Wherever you study, make sure your school is well prepared to launch your cooking career. Look for these hallmarks of successful Culinary or Pastry Arts Programs. A requisite feature of your Culinary Arts curriculum includes an international gastronomic experience, involving a complete immersion in regional Dutch foods. Holland has a distinctive Northern European flavor palate, incorporating a meat and potatoes sensibility into daily meals. Fish and shellfish like sardines; eel, herring and cod are typical of Western Dutch cooking, from an area that also appreciates a strong dairy farming presence. Gouda and Edam cheeses comprise well-known artisinal Dutch exports, along with other dairy specialties. Chocolate and related confections, especially hot chocolate, have come to be associated with Dutch decadence. Traditional dishes consisting of meat, potatoes and vegetables are characteristic of Northern Dutch cuisine. Stews, and thick soups, with Metwurst sausages conjure images of the remote Dutch hinterland, where natives don wooden shoes and eat raw herring. The Netherlands, especially Amsterdam, is an international melting pot, so gastronomic influences are numerous. You’ll find pockets of authentic ethnic cuisine from across the world, each contributing to the country’s unique Epicurean culture. The Southern region of the country puts forth sophisticated specialties that illustrate, for culinary arts students, the diversity of Holland’s food perspective. Hotelschool The Hague’s International Institute of Hospitality Management is considered a leading hospitality and restaurant management college in Northern Europe. If you want to learn the business of hotel, restaurant, and hospitality management, then this is your Hague program. Select from these degrees: Bachelor’s Business Administration/Hotel Management, International Fast Track, which is a 2-year program that adds a Summer School term, consisting of a number of standalone courses. Culinary Arts enlightenment comes in many forms. Throughout Amsterdam and across the country, the Dutch cooking landscape is dotted with informative private cooking schools. As a culinary student, look for ways to augment your on-campus learning by absorbing the unique gastronomy of your environment. Focused study sessions with local gourmands provide invaluable insight into the country’s culinary mindset. Individualized instruction is available at these small schools.